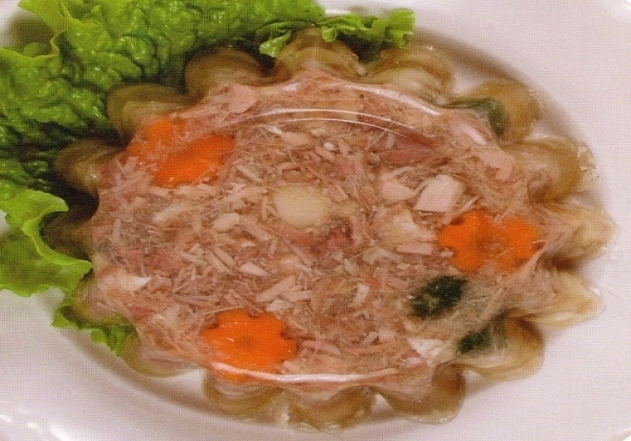 To get a clear and good tasting jellied meat has to be blanched. For that the meat has to be put into cold water, heated until the boiling point and the water then has to be stirred away. Put meat into cold water and heat up quickly to boil, carefully remove the foam, flavour with salt. Boil on very small fire about 2-3 hours. During the boiling remove extra fat from the jelly. Add roasted onion and carrot and parsley and celery root and boil until meat is cooked (about 1 hour). When the meat is almost cooked, add spices. Meat is cooked, if it parts easily from the bone. Take the meat out of the broth, filter the broth. Cool the meat down a bit, chop up into cubes and put back into the broth. Heat the jelly to boil, check the taste. Flavour the jelly relatively salty and spicy, as while cooling down, the taste diminishes. Put the jelly into forms, watered with cold water and let the jelly curdle in a cool place. Before serving, hit the jelly out of the form onto a plate. You can serve cold, strongly flavoured seasonings, mustard, vinegar and horseradish with the jelly. You can also serve boiled potatoes together with the jellied meat.